U.S. Bank has several new credit card offers, including new co-branded cards. The perks are plentiful and the benefits are most certainly impressive. Here are just a few of those offers that are turning consumers looking for better options into loyal U.S. Bank customer. Hotels and and other industries want a piece of that pie that has proven so beneficial with the airlines and naturally, the path to that same success is by partnering with a credit card company – preferably one with few scandals or customer complaints. With so many options, and the fact there are new partnerships on a daily basis, consumers now have more choices when it comes to their financial products than ever before. The key, said Kisch, is to not forget to look at the total cost of actually owning the credit card. If it’s not right for your needs, then it’s not the right credit card for you. There is no shortage of credit cards on the market today and there’s bound to be one that’s going to offer the kind of rewards you’ll actually use. Cash back is always a good choice – and you can find those without annual fees, too – or at a minimum, lower annual fees. So, here’s what we found with U.S. Bank and its many credit card offers. There are a lot of perks with this gem. The Harley-Davidson Visa rewards points can earn Motor Clothes apparel, genuine Harley-Davidson accessories and parts, service and cash certificates. All of your purchases earn points, too. The only kicker with this offer is the cash certificates can only be used at licensed Harley Davidson outlets. That said, you can use your points toward a new motorcycle – which is really a great bonus for those who like to feel the wind in their face and the sense of freedom that comes with every ride you take. Also, you can use your rewards for Harley rentals, too. The satisfaction ranking is high with this co branded credit card, too. Once you open your account, you’ll receive a $10 cash certificate and you’ll earn 3 points for every $1 spent at Harley Davidson dealerships, 2 points for every dollar spent at gas stations, restaurants, bars and hotels. Earn one point for ever dollar spent elsewhere. There are no limits to how much you can earn and this just might be the best part with this credit card offer: every month you use your U.S. Bank Harley Davidson Visa, you’re entered to win a Harley Davidson motorcycle – every single month and every single dollar spent earns an entry. There are no preset spending limits and no annual fees, either. Travel benefits include auto rental collision damage waiver, emergency card and cash replacement, other travel and emergency and emergency assistance services, lost luggage reimbursement and hotel and motel burglary reimbursement. You can even personalize your Harley Davidson card and receive a complimentary annual account summary, too. Finally, there’s a Visa secured card that you can apply for if your credit isn’t strong enough for the traditional credit card. This is another great offer from U.S. Bank. When you spend $500 during your first ninety days, you earn an enrollment bonus of 15,000 FlexPoints. Earn one FlexPoint for every dollar spent, double points in the one category you spend the most in, such s restaurants, airlines or even gas for your car. Not only that, but you’ll enjoy double points on most of your purchases made for you mobile or smartphones – including your monthly bills and any internet charges you incur. How about triple FlexPoints? You get those when you use your US Bank Flex Perks Travel Rewards Visa for charitable donations. Other rewards include $25 allowance per airline ticket and you can begin redeeming them as soon as you hit the 20,000 point threshold (or you can let them accumulate). This is another incredibly successful credit card. Both it and the Harley Davidson credit card are very unique in their benefits and perks – and what’s especially enticing is the surprisingly lack of fees. Other benefits include a 0% intro APR for both your purchases and balance transfers for a full year, your first year’s annual fee is waived – and then it’s only $49 after that. 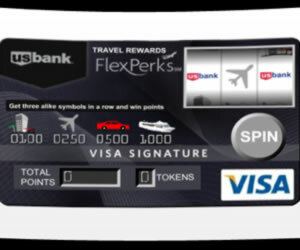 There’s even a US Bank FlexPerks Cash Rewards Visa For Business, too. First, you’ll like the easy application process and as soon as you’re approved, you can begin earning cash back with your very first purchase. Your cash rewards are automatic and for every dollar spent, you’ll earn cash back. There’s no cap on how many rewards you can earn either. Need additional cards for employees? No problem at all and no worries about expiration of those rewards – they never expire. Unlike other cash back cards, you have a few options available when you’re ready to cash in. You can have the funds deposited into your U.S. Bank account, you can have your rewards moved over onto a gift card or you can choose a credit on your monthly statement. With all of these credit card offers, you’ll enjoy easy online account tools, including online bill pay, archived statements and the best fraud security measures in the industry. Are you a US Bank customer? Let us know your experience with the global bank’s credit card offers. Like our Facebook page so you’re always in the know of the latest breaking news in the credit card industry and financial sector.